The judge who approved accused cop killer Tyrone Howard’s entrance into a diversion program following a 2014 drug-related arrest says he did not send Howard to jail because he had no evidence of the defendant’s alleged violent history. Manhattan Supreme Court Justice Edward McLaughlin said he didn’t know 30-year-old Howard had been arrested in connection with a 2009 shooting because the charges in that case were dropped, so they weren’t presented in the 2014 case. 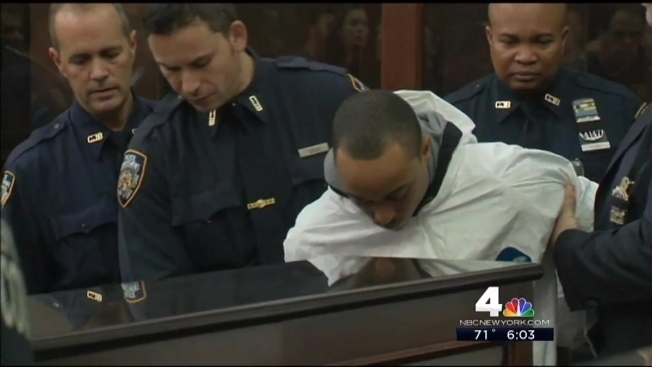 Howard is charged in the Tuesday killing of 33-year-old NYPD officer Randolph Holder. He allegedly shot Holder in the front of the head as he encountered the officer, who was responding to a report of gunfire near the FDR Drive in East Harlem, authorities say. Howard was arrested in October 2014 on a drug-related offense and was jailed from that time through February of this year, when he was released into the drug diversion program, which is meant to keep drug offenders from overcrowding the city's jails. Yet McLaughlin said, based on the evidence presented to him, he couldn’t send Howard to jail. He said that any claims that he had information from the district attorney about past violence were “disingenuous” and that he made the right decision based on the information he had on the defendant. He said Howard passed the necessary screening to enter the drug diversion program before he was approved. Court officials said Howard qualified for the program because he was charged with selling and possessing drugs and was addicted. Meanwhile, Mayor de Blasio and Police Commissioner Bill Bratton say Howard, a wanted criminal with more than a dozen prior arrests, mostly for drug offenses, and 12 prior incarcerations, should have never been on the streets. Randolph Holder was recognized for his dedication to the community, especially young people. Ida Siegal reports. "If ever there was a candidate not to be diverted, it would be this guy," Bratton said. "There are people in our society who are criminals, who are violent criminals ... who should be separated from the rest of society."